The city of Naples is a treasure of art and culture, a vibrant city that never fails to captivate or thrill. This walking tour through the historical centre , which is a UNESCO World Heritage Site , traces its origin as a Greek settlement and brings us right up to modern time, discovering its quaint craft shops and sampling the real, authentic Neapolitan way of life. We start the tour from Piazza Plebiscito, one of the largest squares in Italy with the church of San Francesco di Paola in the background, a neoclassical style church that resembles the Roman Pantheon. Nearby is the Theatre San Carlo, the oldest opera house in Europe and the Galleria Umberto, a liberty-style gallery, now a commercial and office center. Continuing our walk along Via Roma (also called Via Toledo), the most famous shopping street in Naples, we reach the “Spaccanapoli” (“Split-Naples), an ancient, long road that “splits” the city of Naples in two. 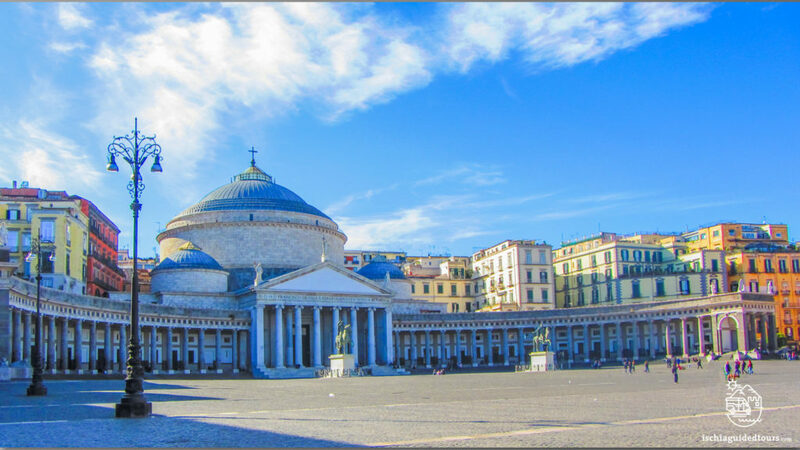 From this point we meet some of the most impressive churches and buildings along the itinerary: the church of Gesù Nuovo, the Santa Chiara’s monastery, the Church of San Domenico Maggiore, until we reach Naples’ cathedral of San Gennaro. Along the way we pass the famous street of San Gregorio Armeno, full of craft workshops where the traditional “ presepe”( the handmade Nativity scene, an institution in Naples) is made all year around.